Confluence Discovery Technologies collaborates with key pharma and biotech companies as strategic research partners. 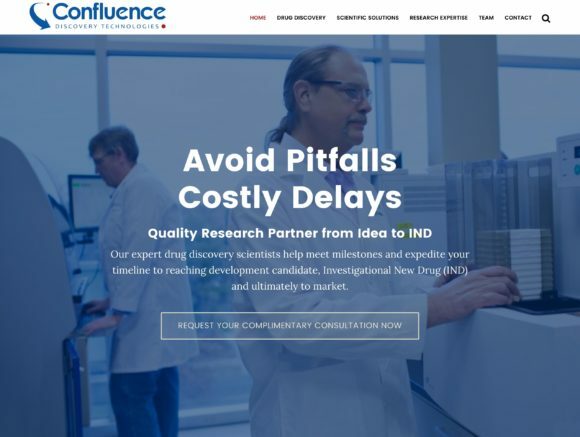 Specializing in drug discovery, Confluence helps these companies meet milestones, expedite their timeline to reach development candidate, Investigational New Drug (IND) and ultimately to market. Confluence Life Sciences (CLS) and its subsidiary, Confluence Discovery Technologies (CDT), needed to refresh its websites. Confluence hired NeuConcept to complete a full website design for both companies. We worked with their team to develop its online marketing strategy, polish content and implement search engine optimized content. We also developed a custom theme and design for their site, which is powered by the WordPress content management system. We continue to support Confluence with website care and updates. CDT is a growing Contract Research Organization (CRO). Confluence hired NeuConcept to guide their leadership team through a roadmapping process for CDT. Together we developed a website that curated the content, making it easy for visitors and potential customers to quickly browse CDT’s strengths, its unique process and the expertise of its team. The website is mobile-responsive and modern with engagement prompts for prospects to take action. CLS wanted their research targets and pipeline to get noticed quickly as well as build their credibility for potential investors and collaborators. One of the challenges was taking a complicated chart and making it mobile-friendly and easy to update by the scientists on staff. We developed visually appealing and responsive design elements that conveyed the information but worked well on any device. NeuConcept also helped create and polish content.